Beautiful hair are a dream of every woman. Nonetheless, sometimes it is difficult to sustain healthy hair and provide them with right care. We blame lack of time, that does not allow us to spend hours in the bathroom. Therefore, we limit hair care to the minimum and hair start to deteriorate in the frighting pace. The rescue for your hair can be natural oil for regeneration and nourishment of hair. One of best conditioning and moisturising oils for parched and fatigued hair with high porosity is the one oil obtained from grape seeds. It is perfect regeneration and protection against damages. However, hair oiling is a treatment requiring some time. On these days when you have no time for keeping oil on hair (it is best to do it for few hours) you can always reach for drugstore cosmetic with content of grape seed oil. 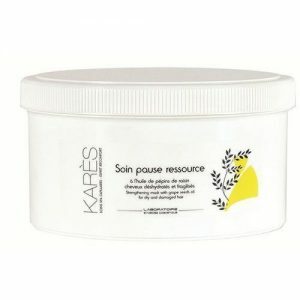 This type of product is hair mask from Kares. It is true rescue for damaged hair in need of moisture, but it also inhibits ageing processes of the strands. What does the hair mask with grape seed oil contain? Main ingredient of this hair mask is of course aforementioned oil. It is an irreplaceable diversity of linoleic acid, in the omega-6 group. What is more, this oil is perfect for high porosity hair, exceptionally damaged and dry. Content of vitamin E and K make hair grow stronger and gain elasticity, but also inhibits ageing and hair loss. Additional oil in Kares hair mask is argan oil, which protects hair against harmful impact of high and low temperatures as well as other mechanical damages. Provitamin B5 moisturises hair and provides them with gloss, while other ingredients have anti-inflammatory and calming properties. Kares hair mask consists of also milk protein, which strengthen hair and provide additional protection. Application of hair mask is very comfortable – apply it for 2-3 minutes on damp hair. After this time rinse it. Keeping it longer on hair can make grape see oil weight down hair (especially if your hair are prone to oily scalp). Hair mask with grape seed oil from Kares is efficient and has 200 ml/6.8 oz. volume.